Bryce Derouin/Daily Mining Gazette Dollar Bay’s Cade Klobucarich (30), Jacob Iacono (14) and Devin Schmitz celebrate after beating Jeffers 54-46 Thursday in Dollar Bay. The Blue Bolts won a conference title for the first time since 1995. DOLLAR BAY — Jacob Iacono leapt into the air and put his entire body into a vigorous fist pump. Just a few feet back, Devin Schmitz extended his arm, screaming in elation, as he made his way to the Dollar Bay student section where he and the rest of his teammates were mobbed by their fellow students with hugs and high fives. All around the grandstands, the Dollar Bay parents and fans recorded the moment on their phones as the Jeffers faithful sat in stunned silence while watching Dollar Bay celebrate a conference championship. 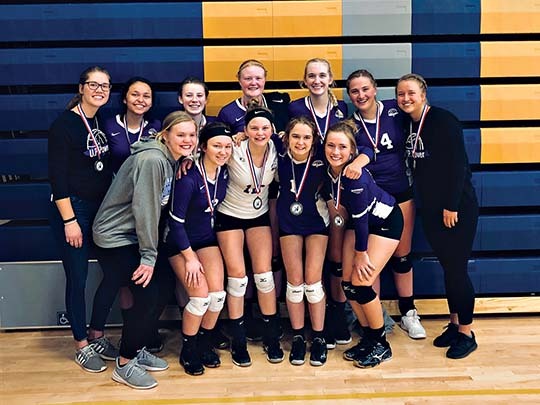 “It used to be a winning tradition here in Dollar Bay, and we’ve been trying to build that back for quite a few years now,” Dollar Bay head coach Jesse Kentala said. On Thursday, they officially returned to their winning ways. The Dollar Bay Blue Bolts captured their first conference championship since 1995 with a dramatic — and occasionally downright hectic — 54-46 Copper Mountain Conference win over the Jeffers Jets in front of a standing-room only crowd in Dollar Bay. Once the hysteria died down, the Dollar Bay players and coaches posed for a photo in front of the conference championship banner that had not been updated since 1995. Everyone in the photo raised a finger to the spot where “2017” will soon be added on. The memorable occasion will live on through the smartphones that snapped and recorded every celebratory second. But the process to return Dollar Bay (16-4, 13-2) to basketball glory began before high-definition phones were the norm in society. “Since they were in fourth grade, we have pictures of us coaching elementary tournaments,” Kentala said of the history of this group and players. “We always knew there were definitely pieces here, and we were really excited about them. Sound ricochets off the walls more at Dollar Bay than any other gym. So with a standing-room only crowd, the cheers were ear-piercingly loud each time a team scored. Early on, it was the Dollar Bay fans making the most noise as the Blue Bolts took a 31-20 halftime lead and held Jeffers to just 8 of 28 shooting (29 percent) in the first half with a tight man-to-man defense. The poor shooting was a stark contrast for the typically hot-shooting Jets, who came in on a 10-game winning streak and averaged 80 points in their last four games. “I didn’t think anyone could hold us down to 46 points the way we’ve been playing,” Jeffers head coach Duane Snell said. “Give Dollar Bay credit, they accomplished it. Jeffers trailed 41-28 going into the fourth and was without Turner after he was escorted to the locker room by Joe Romano. “Carson was getting roughed up pretty much the entire game,” Snell said. “Somebody may have grabbed him and he just retaliated. He was the one who got caught, which usually happens. The guy who retaliates usually gets caught for it. Ironically, Turner’s ejection appeared to inspire Jeffers, and the Jets started the fourth on a 13-2 run. A 3-point play by senior Jaden Wood, and a midrange jumper by junior David Jukkala, cut Dollar Bay’s lead to 43-41 with 3:38 left in the fourth quarter. Schmitz answered with a driving layup before finding junior Jaden Janke in the post on Dollar Bay’s next possession. Janke drop-stepped off the left block and scored to give Dollar Bay a 47-41 advantage with 1:40 remaining in the fourth. Down the stretch, Jeffers had three open looks from 3 to create some late-game drama but was unable to convert — a common theme for the night. The Jets shot 17 of 54 (32 percent) and finished 5 of 21 from 3 after starting the game with 3s from senior Tanner Nicholas and Turner for a 6-0 lead. Dollar Bay went 5 for 7 at the free-throw line in the final minute to secure the victory and ignite the celebration. The Blue Bolts were 16 of 52 (31 percent) from the field. 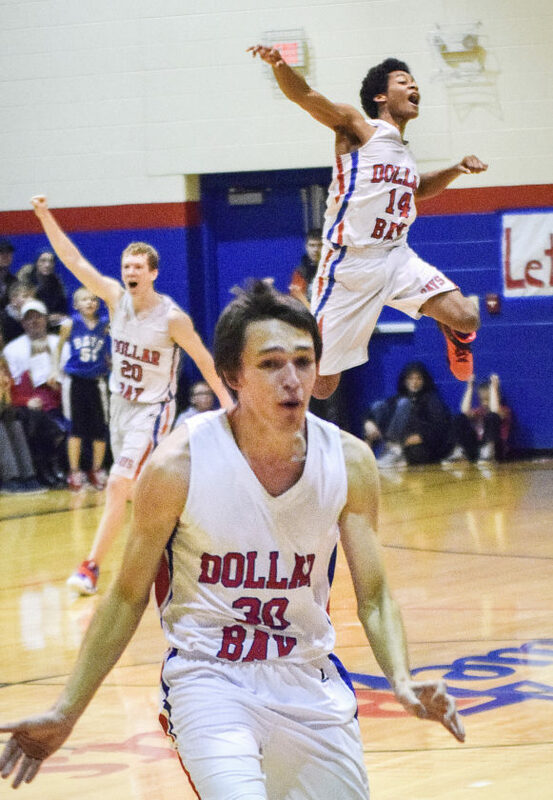 Iacono had 11 rebounds to lead Dollar Bay. The teams will now turn their attention to districts in Baraga. Dollar Bay plays Ontonagon Monday at 6 p.m., while Jeffers will meet the winner of that game on Wednesday at 6 p.m.
Ontonagon beat Dollar Bay 65-61 on Jan. 6 and 64-56 on Feb. 10. Jeffers — Wood 16, Caleb Maki 10, Nicholas 5, Turner 7, Jukkala 2, Jenkins 6. F: 16; Fouled out: None; Technical: Turner; Free throws: 7-11; 3-point field goals: Wood 2, Caleb Maki, Nicholas, Turner. Dollar Bay — LeClaire 5, Iacono 5, Schmtiz 20, Janke 15, Klobucarich 6, Kangas 3. F: 17; Fouled out: None; Free throws: 14-18-; 3-point field goals: Schmitz 3, Janke 3, Klobucarich 2.